Cactaur Proposes To Girlfriend, He Awaits Her Answer While on Pins and 1000 Needles, Could Wedding Be Used In An HD Remake? Final Fantasy VII is arguably the most popular installment in the Final Fantasy franchise. Not only has the game surpassed the sales of all the previous installments, it spawned spin offs, toys, cosplayers, energy drinks, and so much more. A man in Beijing, in the Shijingshan District, decided to take his love for Final Fantasy VII and incorporate it into his marriage proposal. 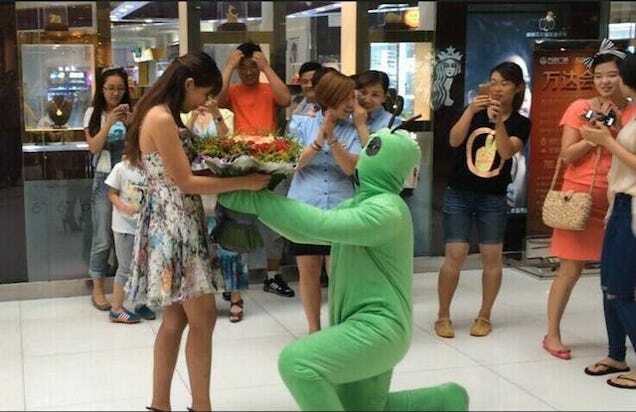 The man, Surnamed Wu, was undoubtedly on pins and 1000 needles during the proposal as he anticipated his girlfriend’s response. Passers by recorded the video on cell phones as the man, dressed as a Cactaur, proposed. He even referenced Final Fantasy VII in his speech. Wu and his fiance, Min Min, met when he was 12 and she was 10. Final Fantasy VII was Wu’s introduction to the franchise, and Final Fantasy XII was Min Min’s. Their love of Final Fantasy and each other blossomed from there. There is no definitive date set for the wedding, as of yet, or if they will dress up as Cloud and Aerith while reciting their vows. Remakes of Final Fantasy VII have been circling the globe for many years. Although each fanboy and fangirl would rush out and pre-order an HD version of Final Fantasy VII in an instant, Nomura has stated that he will not consider moving the game to HD until another Final Fantasy game excels beyond VII’s sales. However, Yoshiri Kitase is not afraid to take the challenge on. I doubt we will see the HD remake any time soon, but when or if we do, maybe Wu and Min Min will get a scene inside the Golden Saucer, where Cloud and the gang can become a part of their marriage ceremony.